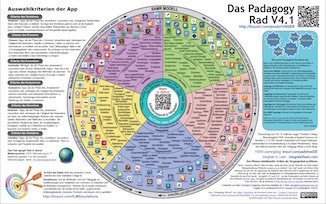 A couple of weeks ago I was doing some research for a project that I’m currently working on(internal differentiation in the classroom with the help of tech/tablets) and stumbled across Allan’s Padagogy Wheel. I sent him an E-mail right away asking for permission to include it in my work. What’s followed has been an inspirational exchange that has further intensified my passion for transforming teaching and integrating tech in he classroom. A lot of teachers are eager to change the way they have traditionally taught but are overwhelmed by the ongoing dynamic of technological development. The Padagogy Wheel gives them a framework to work with and inspires them to embark on an exciting journey that will change the way we look at teaching. I am excited to be part of this process and to see some of my ideas included in the newest version of the wheel. 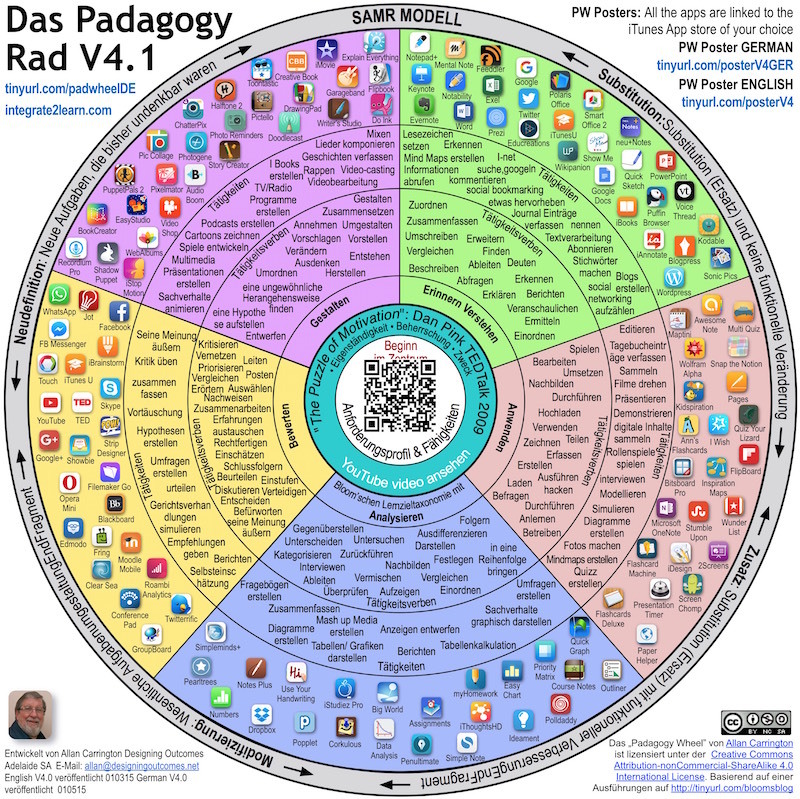 Inspired by the Padagogy Wheel I’ve developed a model that helps teachers addressing their student’s individual needs with the use of tech. I will introduce it on this blog in the following days. The GERMAN Wheel Poster Print (11.1 mb): This is a bigger file size to print the Poster as an A3 or A2 hardcopy suggest laminated. The GERMAN Wheel Poster Screen (1.7 mb): Usually just for computer screen use. The Padagogy Wheel poster will be available in at least 21 languages by the end of 2016. Six languages are already published. They are • English • Spanish • German • Norwegian • Chinese • Arabic. Added to this, there are six more that will be published by the end of Feb 2016. They are • Catalan • Dutch • French • Polish.• Portuguese • Russian. A further nine languages are committed to translation during the rest of 2016. If you are interested in helping Allan translating the Padagogy Wheel into your heart language, then please read this Translation Method and get in contact with him.